Limited Company Tax Calculator added! Over on our sister site Employed and Self Employed, we now have a Limited Company Tax Calculator. If you are self employed through a limited company (as many people, like IT contractors, can be), then your tax is worked out differently from if you are just plain-old self employed. The limited company pays you a salary, which is typically quite small, and the rest of the company’s profits are paid to you in dividends (after the company has paid corporation tax), which are taxed at different rates from other income. 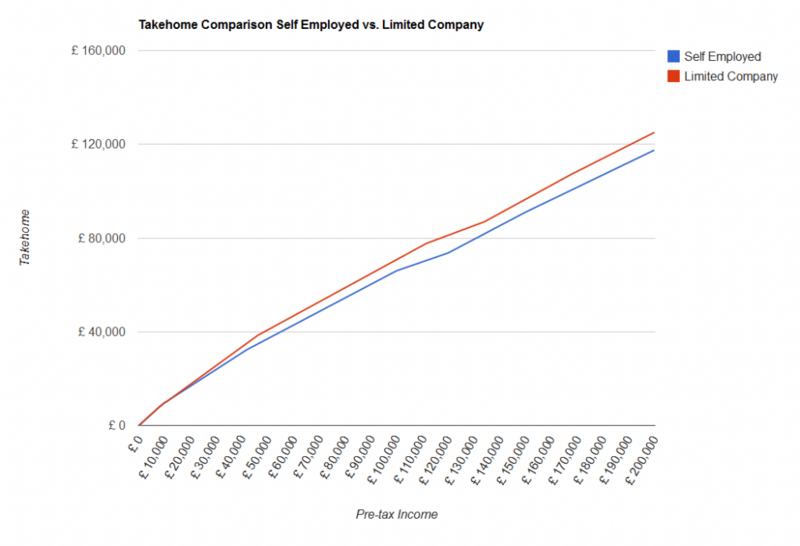 The following graph shows you a comparison of how much income you get to take home as self employed or with a limited company (click on the image for a larger version). As you can see, in this example (with typical values entered), the limited company approach allows you to take home more of your income. However, this does come at a cost – more paperwork is required for limited companies, including registering with Companies House and having your books prepared by an accountant. Accountant’s fees might eat up a significant amount of the difference in take-home, so it might not be worth switching from one to another. If you’re interested in being self employed as a limited company, speak to an accountant to find out if it is right for you. To start performing tax calculations, check out the limited company tax calculator over at Employed and Self Employed.